Today saw 60 members play rounds over the par 71 (36-35) Gullane No 2 and par 68 (34-34) Gullane No 3 courses to see if they could get their name on the Uniroyal Trophy as Edinburgh and East of Scotland Alliance Champion for 2017. 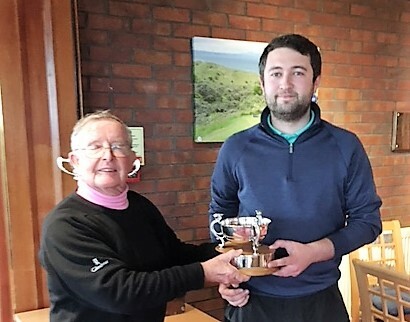 The morning round saw Jamie McLeary (Dalmahoy) with a two-shot lead on the No 2 course with a three-under-par 68 but a sensational nine-under par 59 (29-30) by Chris Curran (Bathgate) on the No 3 course suggested he had a firm hand on the silverware. Chris had birdies at 2, 3, 5, 8, 9, 11, 13, 17 and 18 with pars at the nine other holes. 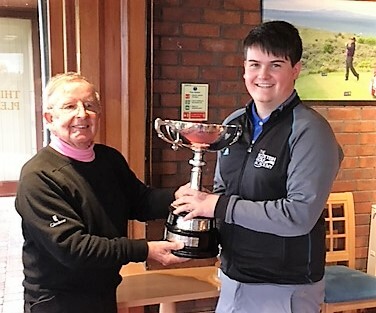 A worthy mention goes to Scott Gillies (Craigielaw) for his morning outward nine on Gullane No 3 with a seven-under 27 including five birdies and one eagle. Unfortunately, the inward nine did not produce any birdies but he ended up with a creditable 64. The afternoon saw some more fine scoring with McLeary adding a 65 on No 3 to secure third place overall on 133 with Louis Gaughan (Bathgate) in second spot with a three-under 68 on No 2 for a total of 131. However, a one-under 70 by Chris Curran gave him a total of 129 to become the new champion and secure the silverware. Curran (right) is pictured above receiving the Uniroyal Quaich from committee and life member John Anderson. Gavin Clark Trophy and it looked like a net total of 137 might be the mark with five names on this total - Willie Laing (Prestonfield), Marc McAdam (Liberton), Robin Cockburn (Harburn), Steve Dand (Pumpherston) and Phil Leggate (Musselburgh). However, late in the day Kieran Cantley (Liberton) took second prize on 135 (69 +1 on No 2 and 64 +1 on No 3. Winner of trophy by two shots was Nathan Free (Longniddry) with a net aggregate of 133 (73 less one on No 2 and 62 less one on No 3). Nathan Free is pictured above received the Gavin Clark Trophy for the best net aggregate from John Anderson. In the Senior 18 hole event on No.3 Mike Louden (Glencorse) took the top prize with a 2 over par 70. 3. Andy Rothney (Deer Park) - 642.0. Next week the final event of the season takes place on Thursday when the East Alliance plays the West Alliance in their annual match, hosted this year by Bruntsfield Golfing Society.